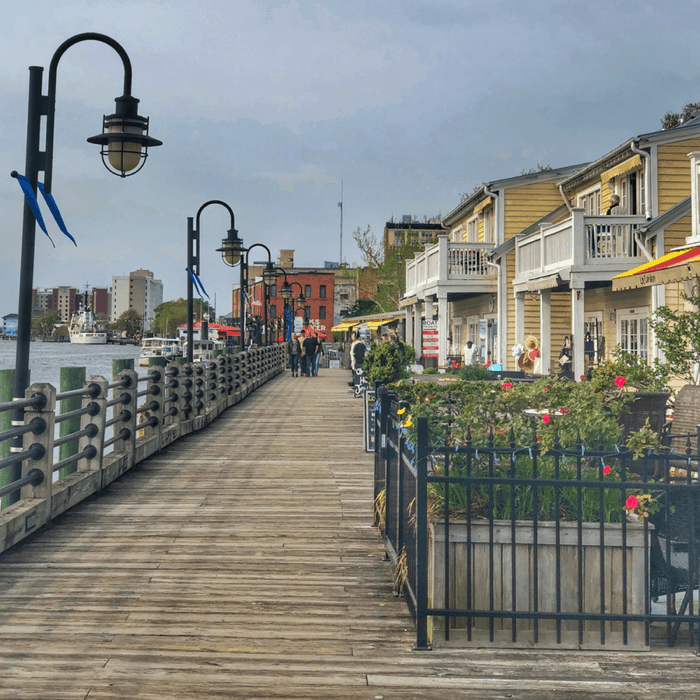 A great place to start your visit to Wilmington is downtown. 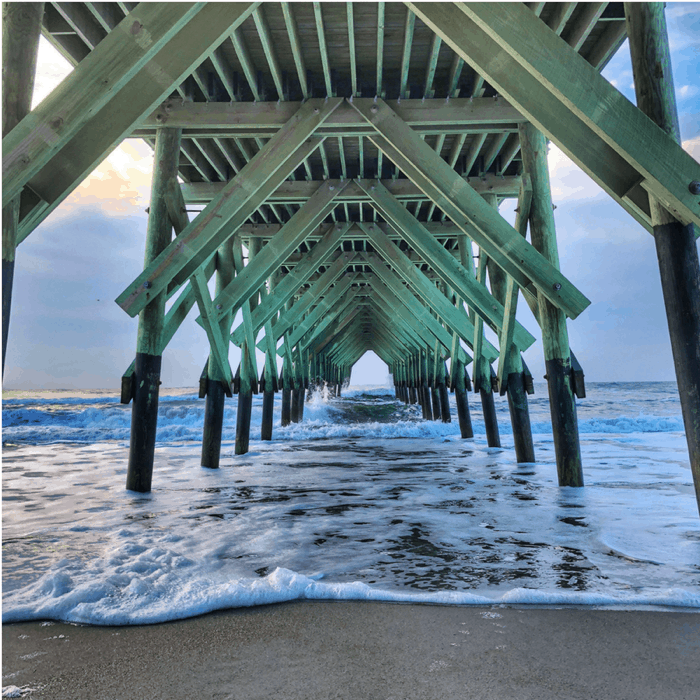 You’ll find gorgeous architecture, beautiful waterfront, and southern charm and hospitality. One of my favorite ways to learn about an area is by taking a tour. 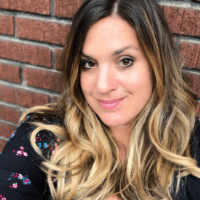 I’ll share a little more about the tours that we experienced and there are also food tours available with Taste Wilmington, if you are feeling brave, you might be interested in the ghost tours with a Ghost Walk of Old Wilmington. 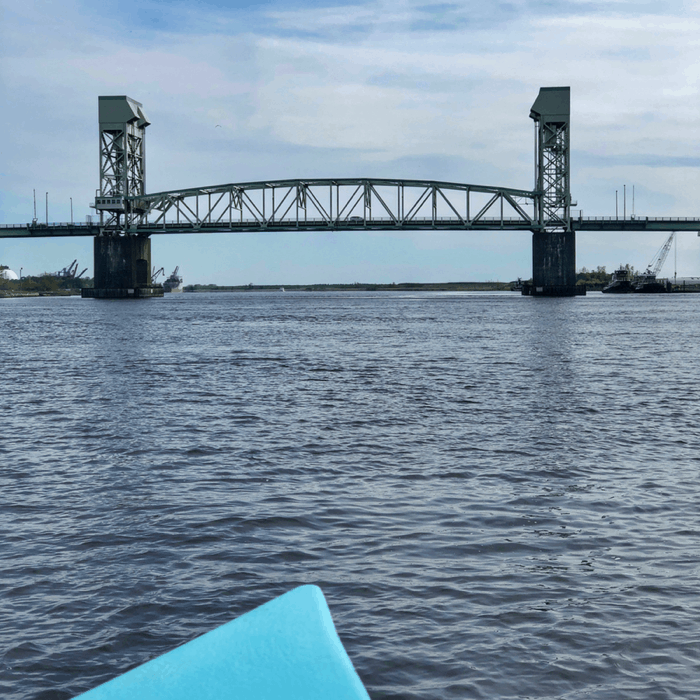 Wilmington is known as the “Hollywood of the East” with 500+ film and tv credits and you can learn more about those on a 90 minute Hollywood Location Walking Tour. 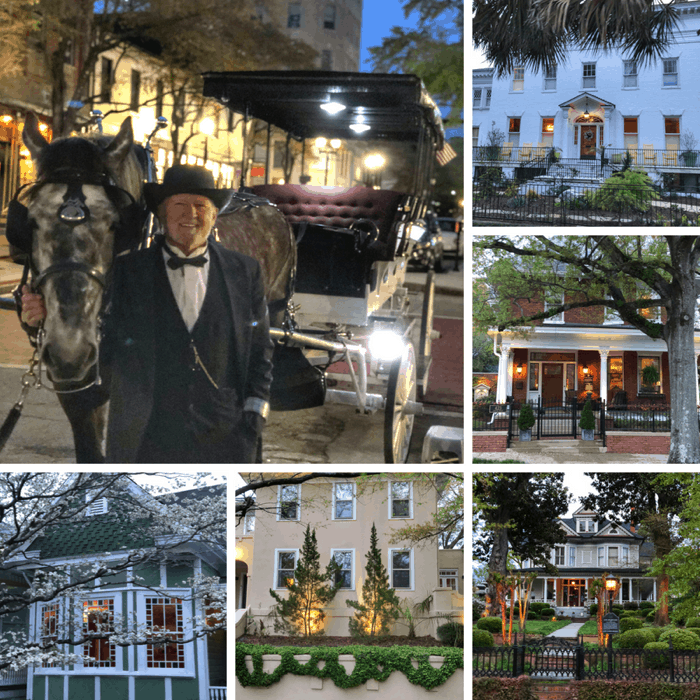 We really enjoyed an evening horse-drawn carriage ride that shared more about the history of downtown Wilmington and told us about many of the gorgeous homes as we passed by at around 2mph. It was so nice to take things in at a slower pace! Another cool thing about this company is that many of the horses are rescues that were abused and unwanted Percheron draft horses that were saved from the uncertain fate of the auction block. 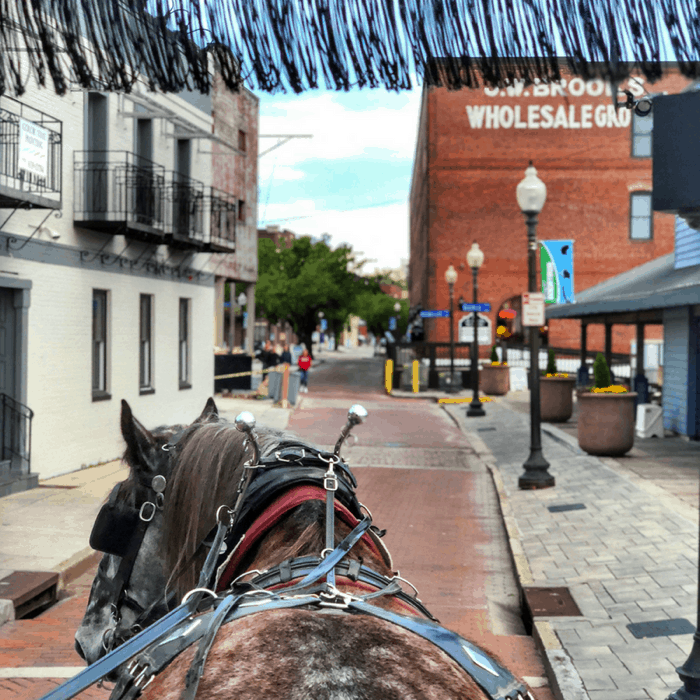 The horses are rotated during the day for exercise from a stable in downtown Wilmington and each horse only spends one week a month downtown, and two or three weeks minimum out on pasture on their farm. The tours help fund the rescues of more horses. Carriage Tours depart continuously on the half-hour from the ½ block of Market Street from 10AM to 10PM. 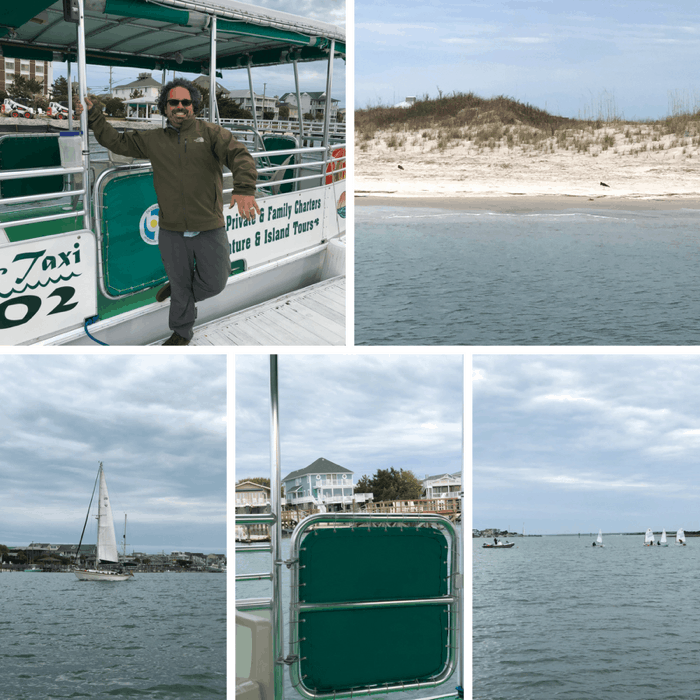 Located at the Riverwalk, guests have the option of tours that take you more downtown or farther down the Cape Fear River on the Eagles Island Cruise. There are rotating cruises on the hour. 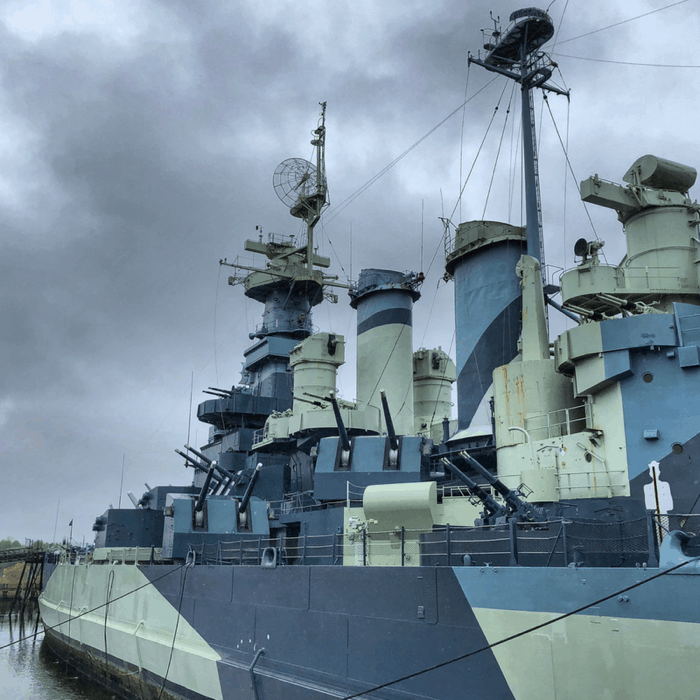 If you visit on the even hours you will cruise north to see more of the historic downtown and Eagles Island where you can see a view of the USS North Carolina Battleship and learn more about a local shipwreck. Our tour took place during the odd hour which took us under the Memorial Bridge to see the State Ports which were also a filming location for Ironman 3. 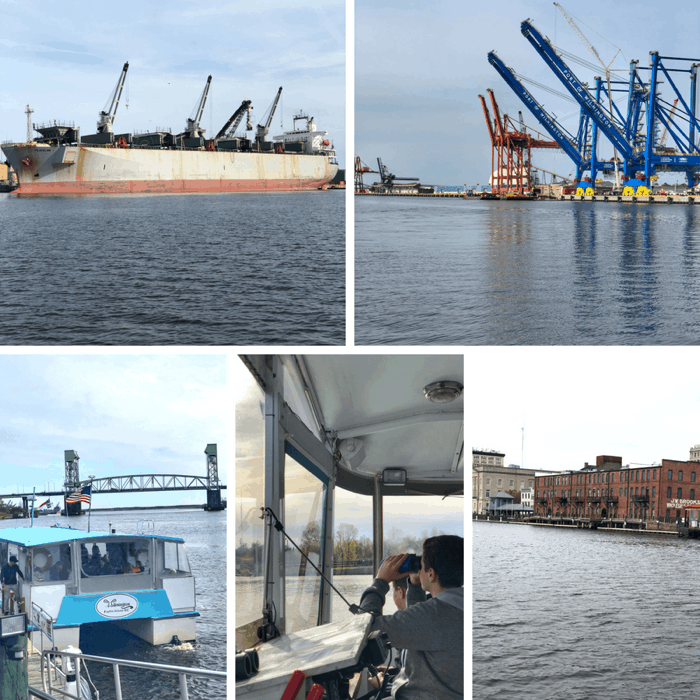 You’ll learn more about a WW2 Wilmington Ship Yard along with wildlife spotting along the way with binoculars provided on the boat. Check their website to learn more about private and special event cruises. 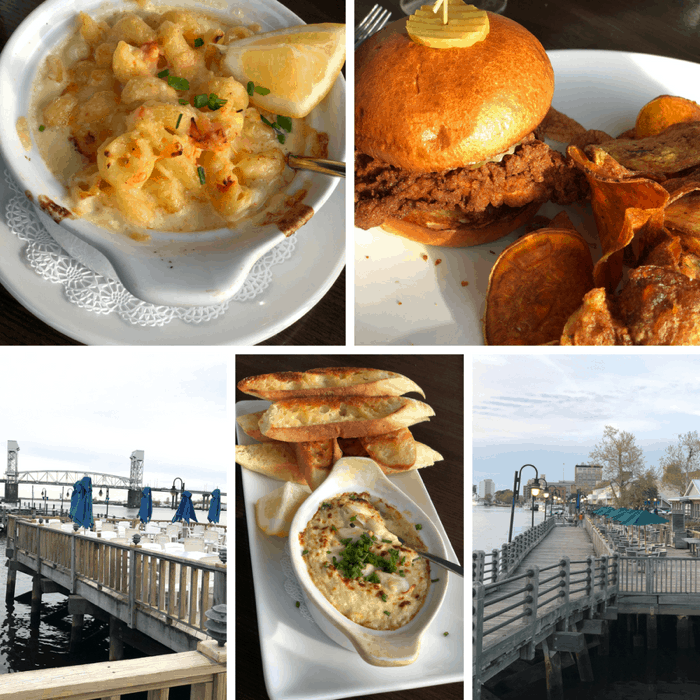 Located a short walk from Wilmington Water Tours, Pilot House Restaurant offers guests a casual dining experience with views of the riverfront from inside or from the patio. You can’t go wrong with either of those appetizers! 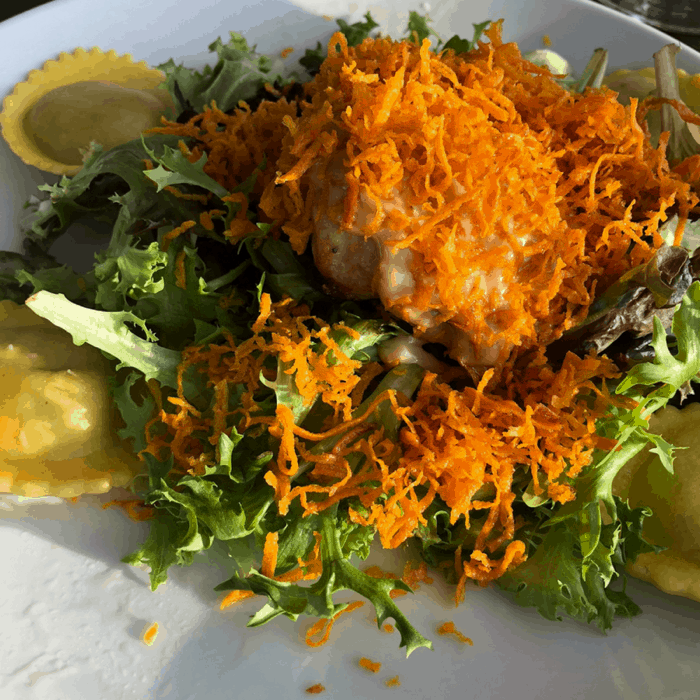 I ordered the House Specialty, the Sweet Potato Grouper (fresh local grouper, sweet potato crisps, mushroom ravioli, atop mixed greens with balsamic aioli) and the Southern Fried Chicken Sandwich was also a hit. *There is a free parking lot for the restaurants at the corner of Water & Ann streets. 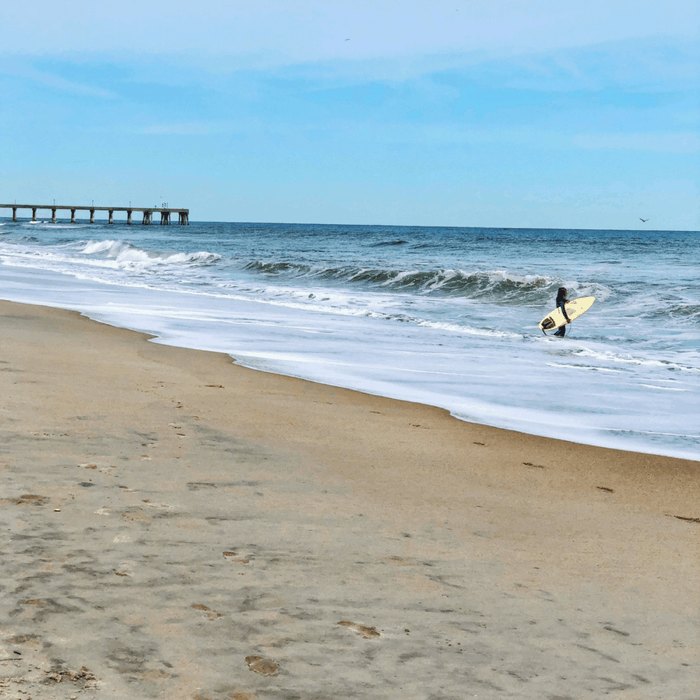 Wrightsville Beach is known for being one of the best beaches in the US to surf with a surfing history that dates back to 1909 that continued to evolve in style and popularity over the years. You can enjoy watching the surfers show off their skills or you can take lessons or attend a surf camp to learn for the first time or build on your current skill set. 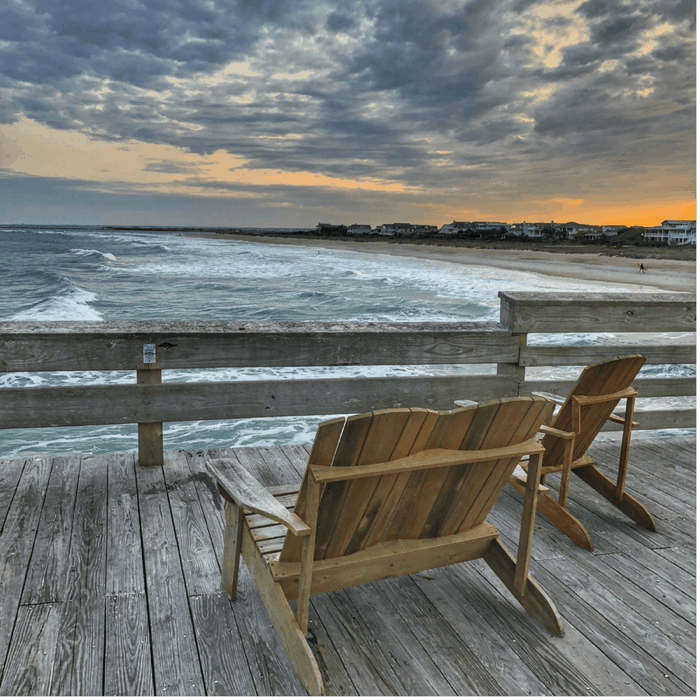 Wrightsville Beach was also the first beach to ban smoking in 2012 and takes pride in being a clean and environmentally friendly destination for families with metered parking available. If you want to learn more about protecting and restoring the coast you might want to stop by the NC Coastal Federation located next to the Wrightsville Beach Museum. 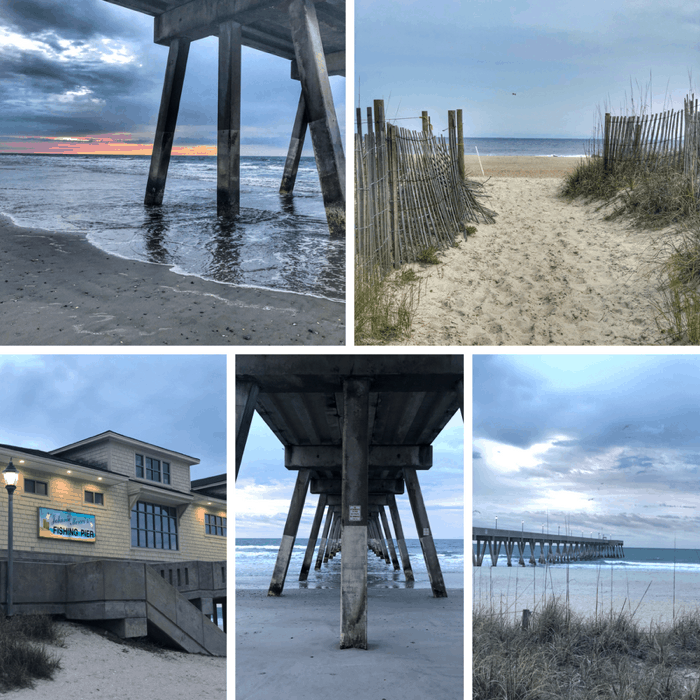 Johnnie Mercer’s Pier is a great spot for taking pictures at Wrightsville Beach and the only concrete fishing pier in North Carolina. The 12oo ft pier does charge a small fee to walk on the pier and there is a parking lot nearby that charges by the hour. As a Midwest girl, I feel obligated to soak in as much time as possible by ocean whenever I visit a destination. That means losing sleep to experience the sunrise with sand and water between my toes and feeling a sense of awe and gratitude as the sun sets over the water. Despite a weather forecast that didn’t fully cooperate, I still got to experience several moments of wonder during our visit. If you enjoy an early morning work out during a visit, you might want to check out the 2.45-mile fitness trail called The Loop that circles the island. Blockade Runner Beach Resort is a family-friendly resort with beach access, Southside access ( where you can try kayaks, stand-up paddle boards, canoeing, sailing, fishing), an outdoor pool with plenty of seating and outside restaurant and bar, activities for kids, and beautiful grounds where you have a good chance of seeing wild bunnies. We stopped there for lunch and toured the property and my husband and boys made it their mission to swim in the ocean even though the water and air temperature were both in the 50’s that day. Some of our lunch highlights at EAST Oceanfront dining were the Fish tacos (Seared mahi-mahi, cabbage, jalapeno crema, pico de gallo, queso fresco, pickled jalapeno), Block Burger (Certified grass-fed beef, cheddar cheese, grilled onion, arugula, tomato, brioche bun) and the Bánh mì sandwich. 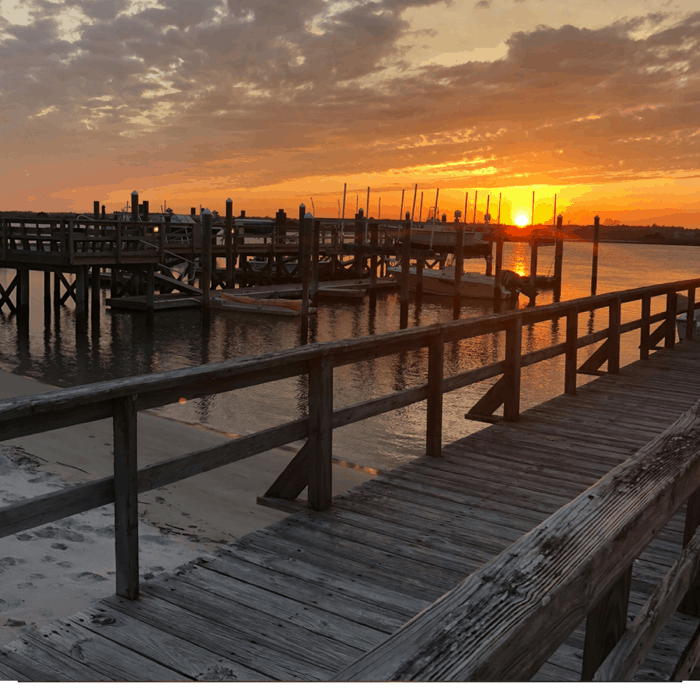 Located across the street from the Blockade Runner Beach Resort at the Southside pier, you can learn more about the ecology of the area during a 1-hour History Harbor Tour. During our tour, we learned that there are 7 species of birds that nest on the beach. Our Captain and guide, Joe Abbate, had a birding book and pointed out the various species that we saw along the way. 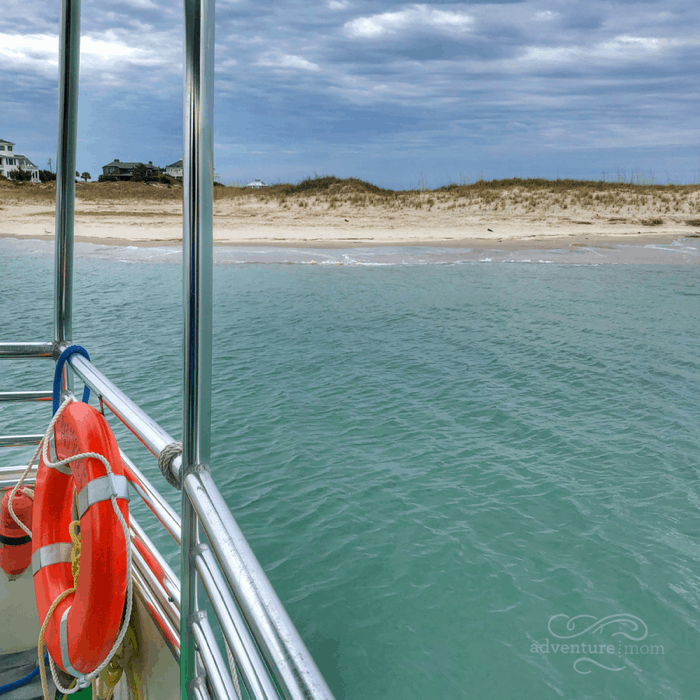 In the summer months, you can take a boat tour to the Masonboro Barrier Island that is an undeveloped barrier island only accessible by boat. The tour is very relaxing and our guide did a great job of sharing about the area in a way that was interesting for kids and adults. 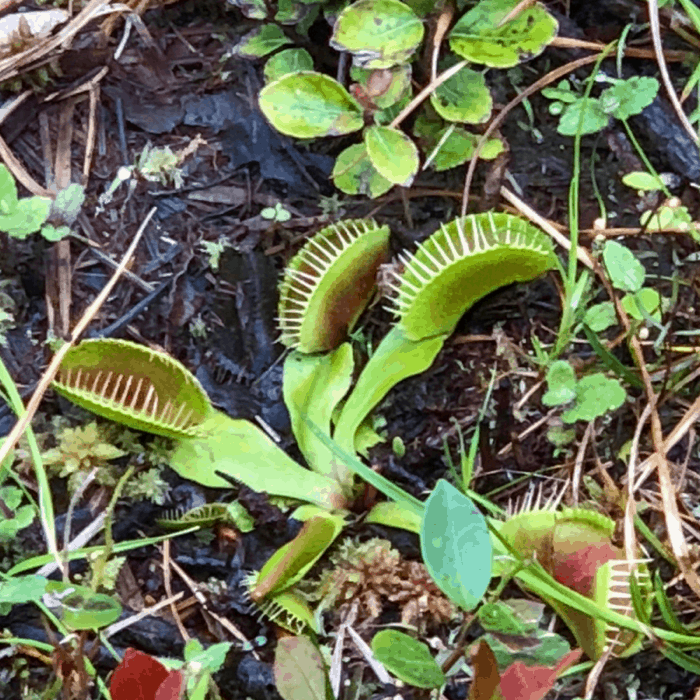 This State Park is one of the few places in the world where you can see the Venus Flytrap in its native environment. During our visit, we toured the park with a park ranger to check out the campsites (if you don’t like tent camping or have your own camper there quite are a few cabins available for rent), recreational areas with access to the water, and enjoyed a guided hike on the Flytrap trail where we learned more about the 13 distinct plant communities in the area. There are 761 acres at the State Park. If you plan on hiking, it is recommended that you wear pants and closed toed shoes and bring along insect repellant and sunscreen. We stumbled upon this park by accident. 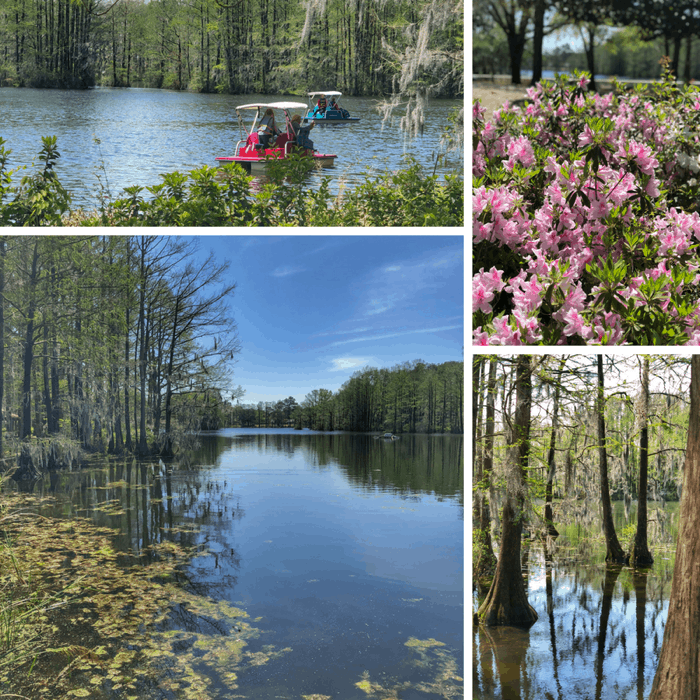 Greenfield Lake Park is a beautiful park located minutes from downtown Wilmington. 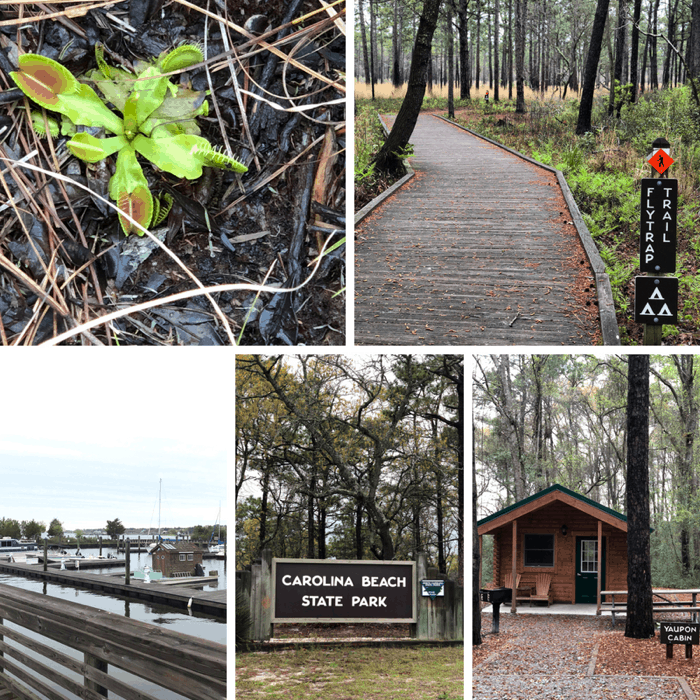 There is a walking trail, playground, fishing and canoe, kayak and paddle boat rentals. 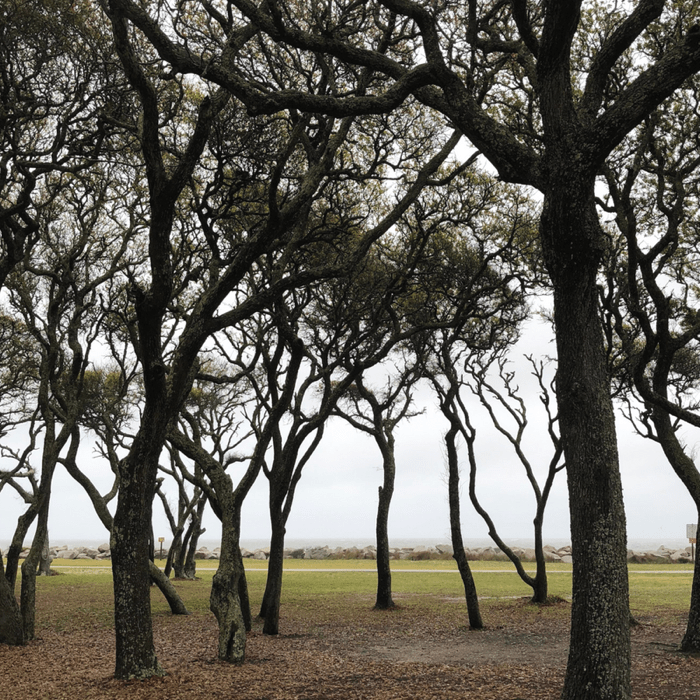 This state park is located close to the North Carolina Aquarium at Fort Fisher. It has 6 miles of beaches and really cool oak trees that have been twisted and formed by the elements through the years. If our weather would have been better during our stop there I would have taken the boardwalk to the beach. 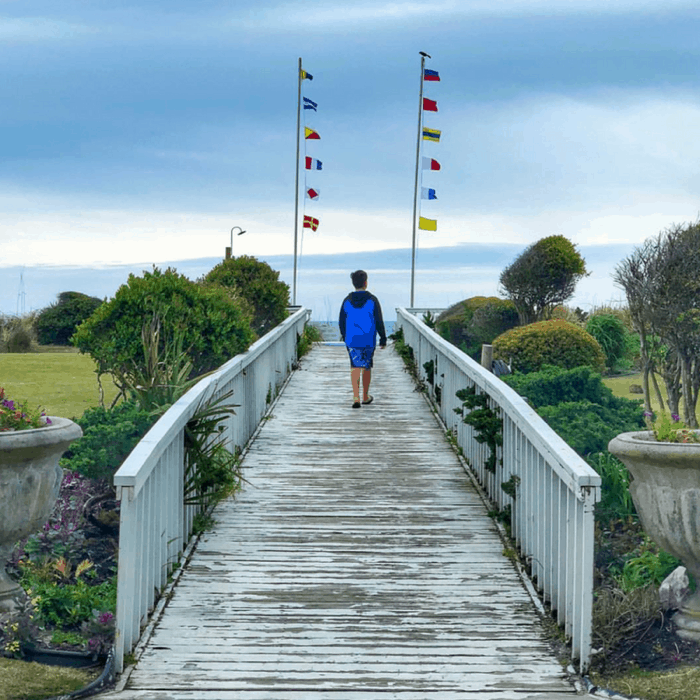 Another noteworthy stop near Kure Beach is the site of the largest land/sea battle of the Civil War at Fort Fisher State Historic Site and Museum. Unfortunately, it wasn’t open during our visit but it’s free to visit and perfect for war history enthusiasts. 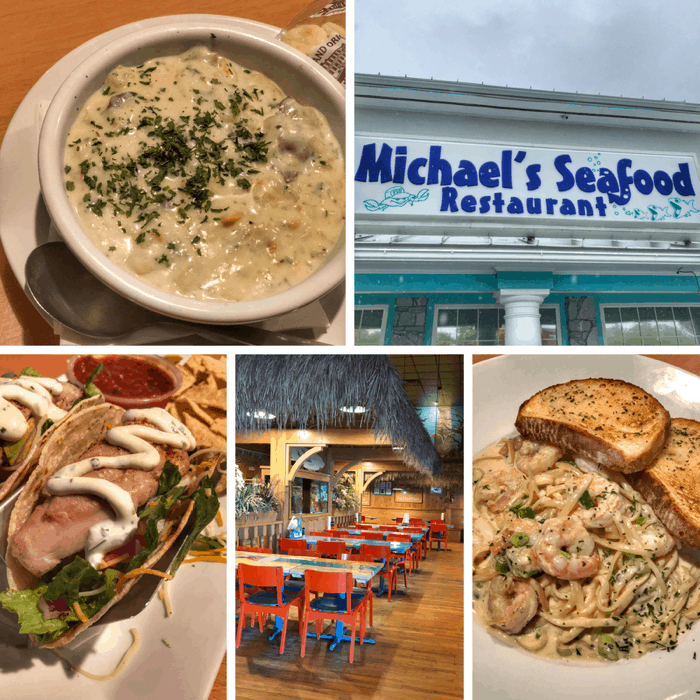 We ate incredible food the whole time we were in Wilmington but Michael’s was my favorite! 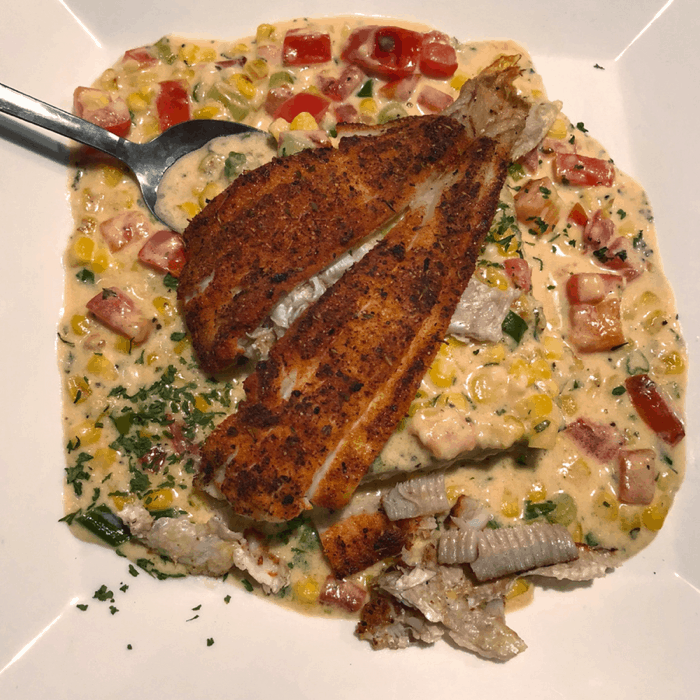 I ordered the Blackened Fish & Grits (today’s freshest catch, garlic parmesan sauce, corn, fresh tomato, and scallion served over our house made grit cake) which was a gamble that paid off big….because grits can go either way. Michael’s Seafood was the home of my FAVORITE dish of the trip. Seriously, it’s the type of dish I dream of because it was so good! Make sure that you also try their award-winning seafood chowder. Enjoy a dinner with a view. 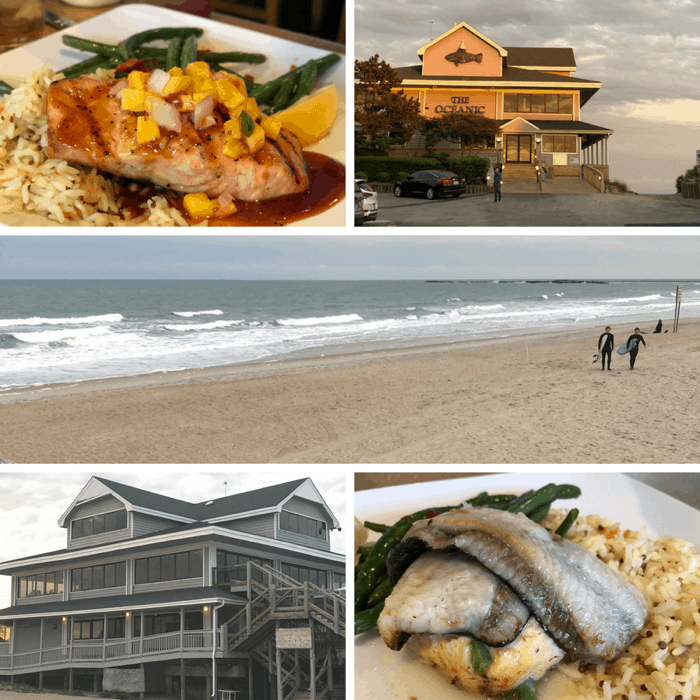 Oceanic Restaurant offers lots of seafood specialties with ocean views that are hard to beat! You can dine inside or outside and then take a nice walk on the pier afterward to watch the surfers as they catch their next wave. 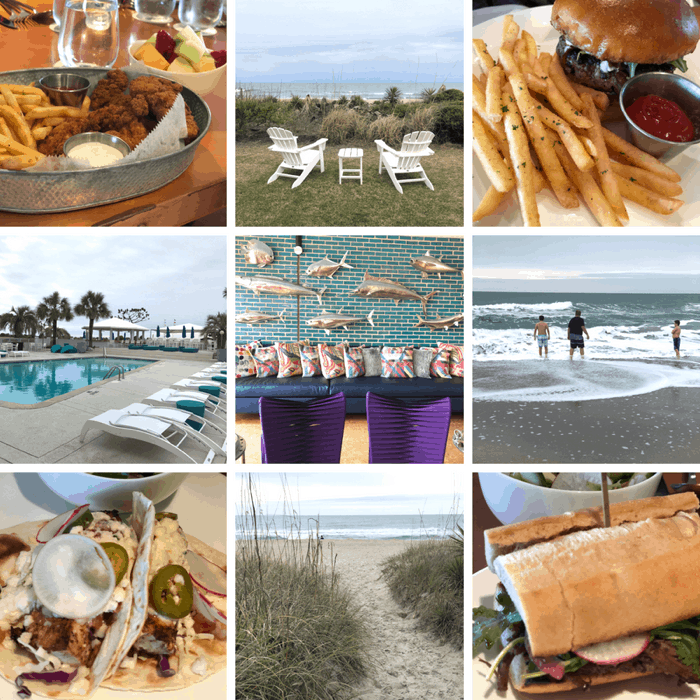 During our visit, we tried the Sunkissed shrimp as an appetizer, stuffed Flounder, Chipotle Atlantic Salmon & Shrimp followed by a relaxing time on the beach playing and watching the surfers before the sunset. Britt’s Donuts at Carolina Beach was highly recommended to us by several people but unfortunately, it was closed during our visit. 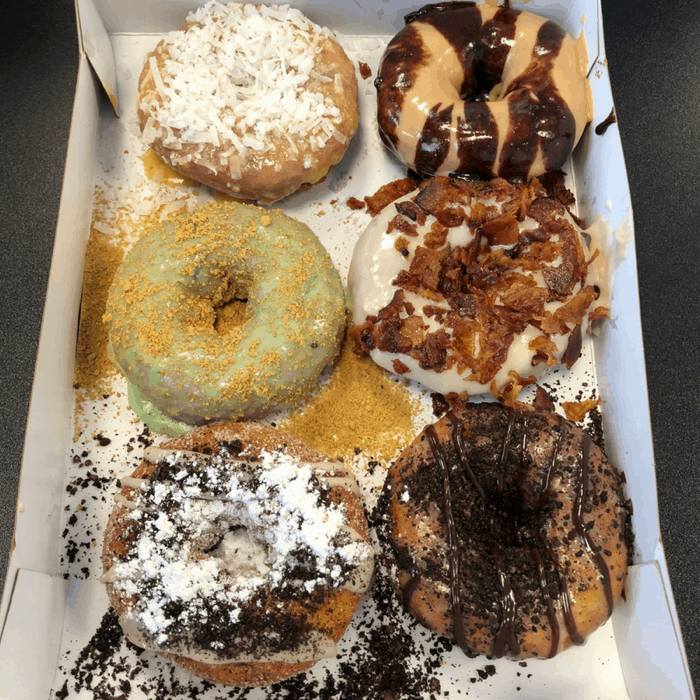 I was also told that Duck Donuts is a MUST to try when you visit the Outer Banks and lucky for us, Duck Donuts also has some locations in Wilmington. 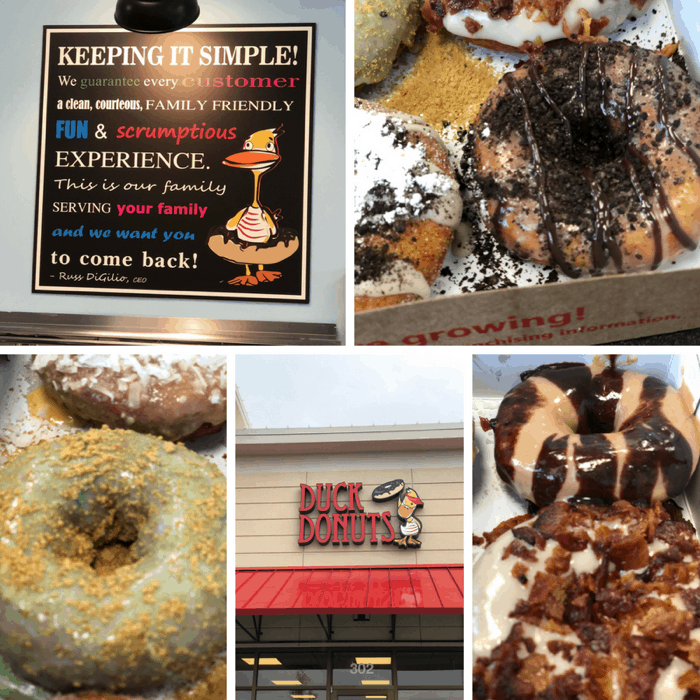 They make custom donuts on the spot with combinations that are fun and creative. I tried a one with Keylime glaze and graham cracker topping. We also had flavors with peanut butter, oreo, and maple bacon. 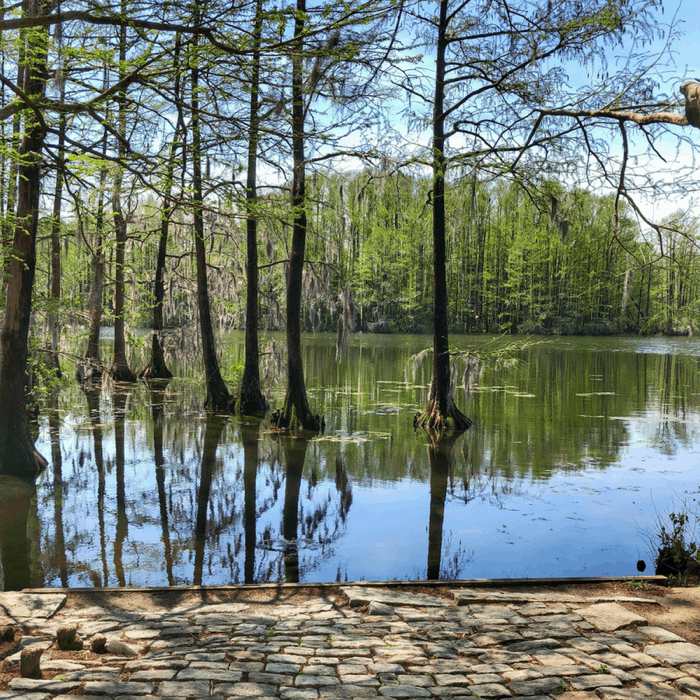 Learn more about the history of Wilmington, local culture, and ecology at the Cape Fear Museum. 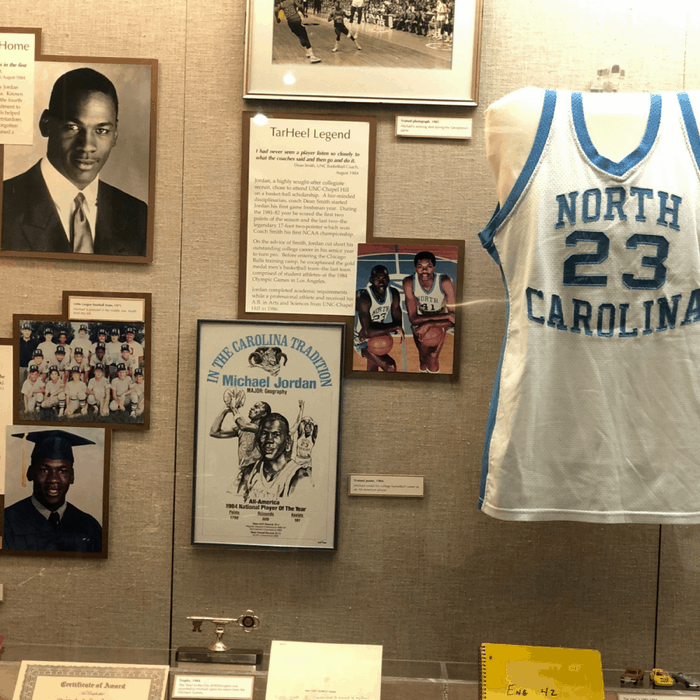 Sports fans will love the exhibit featuring memorabilia from Michael Jordan who grew up in Wilmington. 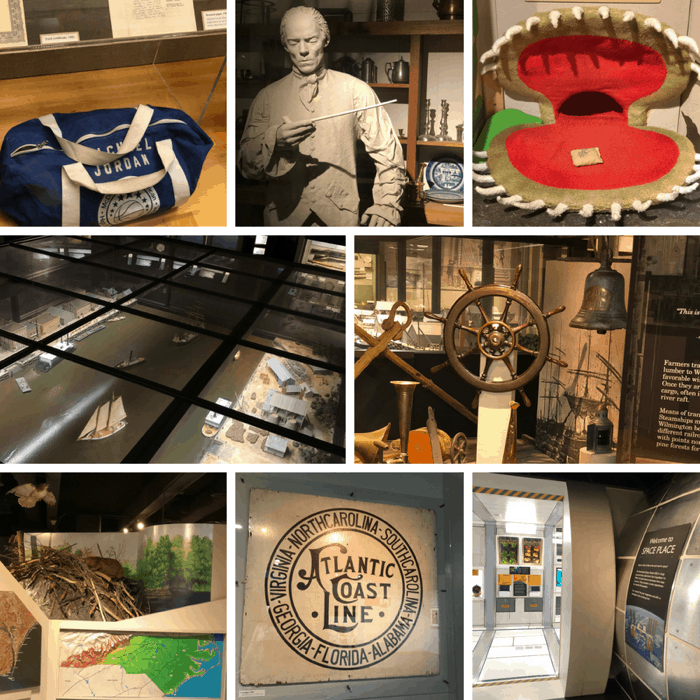 There is a lot of history to read and several interactive components to help you understand more about the Cape Fear region. Make sure that you check out the interactive Venus Flytrap exhibit in the Michael Jordan Discovery Gallery. Kids will enjoy “Space Place” where they can imagine what it is like to be an astronaut in space while they participate in several STEM hands-on on exhibits. 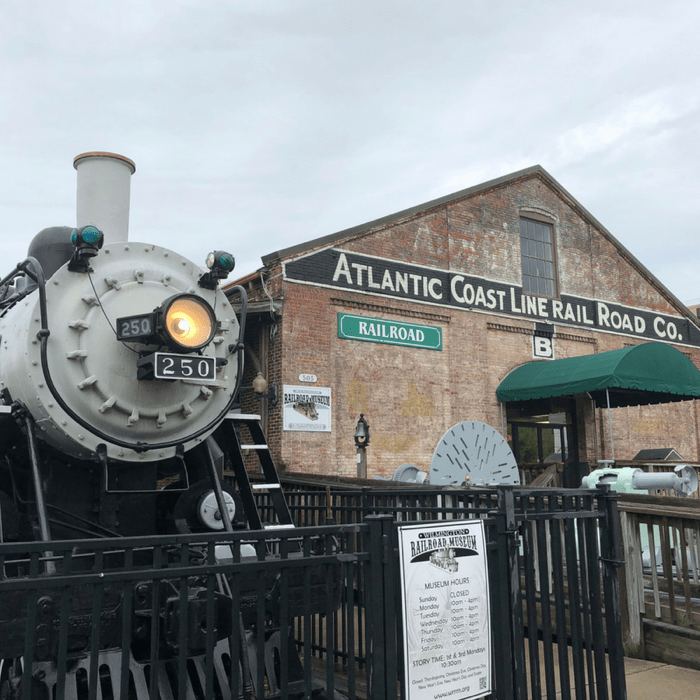 Located next to the Wilmington and Beaches Visitor Information Center, Wilmington Railroad Museum is the perfect adventure for train enthusiasts young and old. 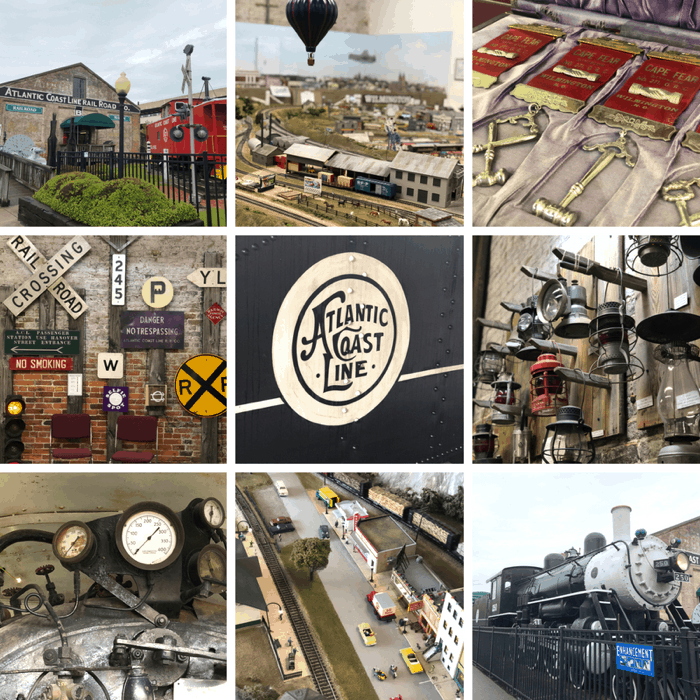 Showcasing the Guinness World Record-holding longest model train made up of 1563 carriages and 31 locomotives, history of all of the aspects of train history, and don’t forget to take pictures next to a 100-year-old steam locomotive, caboose, and boxcar. The Museum does have several dedicated parking spaces for museum guests and street parking is free on Sundays. 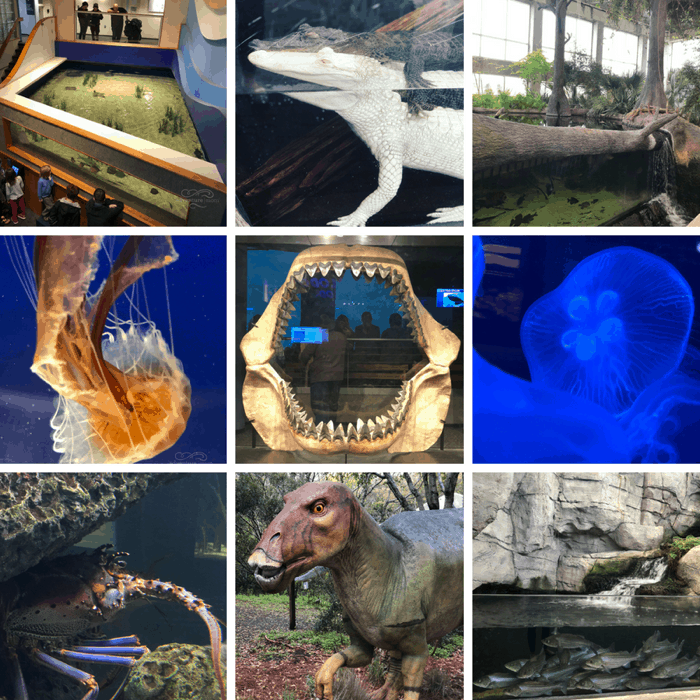 Ranked as one of the top 20 US Aquariums on Trip Advisor, North Carolina Aquarium at Fort Fisher is a great place to learn more about marine life in the area. 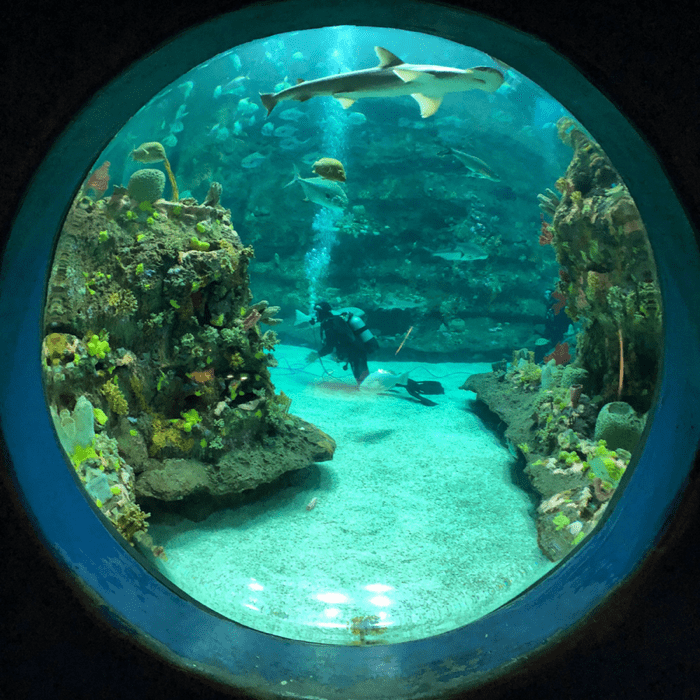 The aquarium has interactive exhibits, touch tanks, live feedings and dive shows inside the two-story ocean exhibit with sharks. One of my favorites moments during our visit was discovering the two alligators that appeared to be hugging and the dive show. Outside kids can burn off some energy on the playground and walk the trail to see the life-size animatronic “DINOSAURS!” exhibit until September 2018. 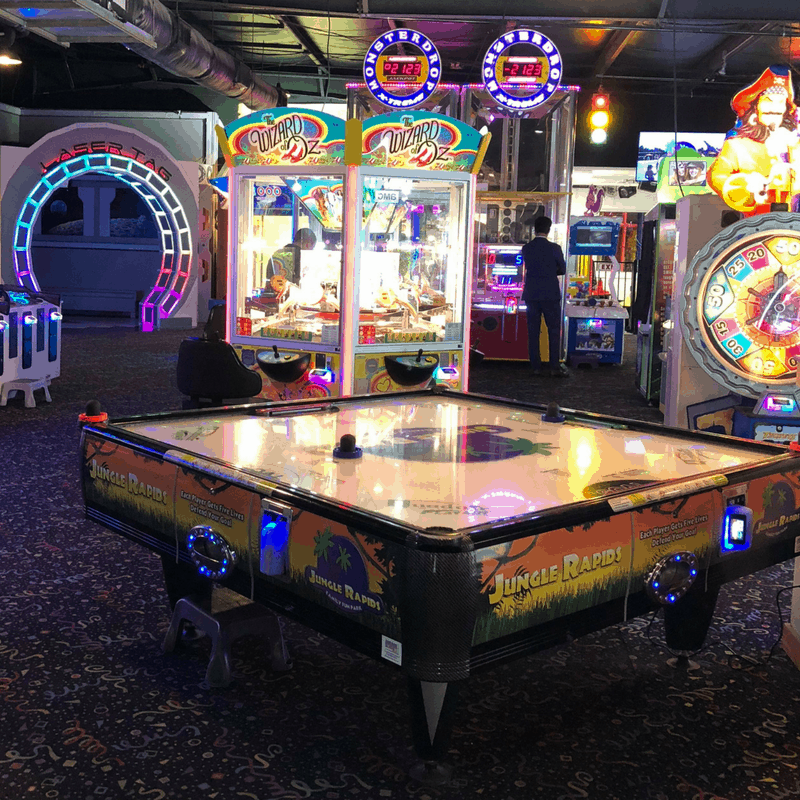 Featuring adventures indoors and outside, Jungle Rapids Family Fun Park offers lots of fun activities for families of all ages. 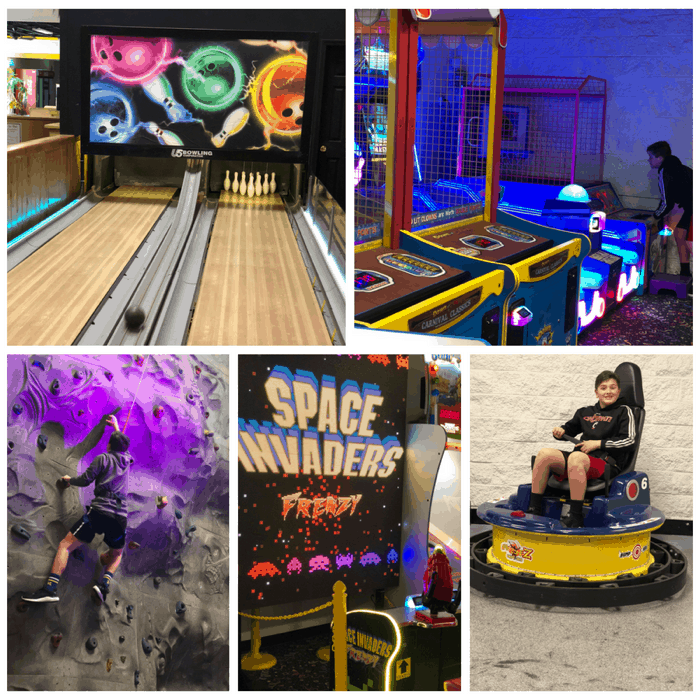 A few of our favorites during our rainy day visit were the laser tag, mini bowling, 4 person air hockey table, the rock climbing wall, and the Spin Zone Bumper Cars. Younger kids ages 3-8 will love the Kids Jungle play structure and there are lots of arcade games that appeal to all ages. Outside you can play Jungle mini golf, race go-karts, drop 40 ft on the Skytower, and during summer months you will want to check out their waterpark which is the largest in the area. 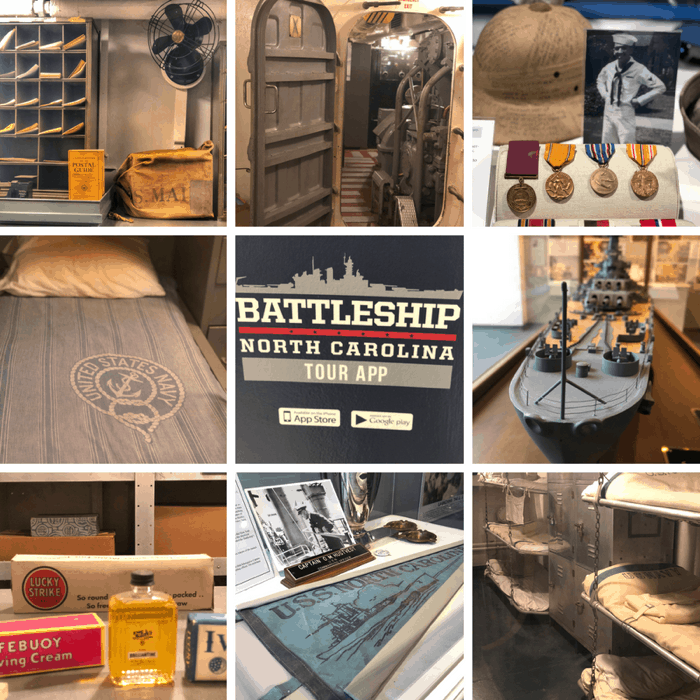 I’ve toured battleships before but I was truly impressed with how much access you are given on a self-guided tour of the WW2 Battleship North Carolina. With 9 decks available to the public, you will definitely want to allow several hours to explore (they recommend at least 90 minutes). To enhance your experience, download the Battleship North Carolina app for an audio tour to learn more as you go. There are many ladders and stairs to climb up and down and close-toed shoes are highly recommended. You really get an appreciation for how the crew lived and sacrificed to protect our freedom. The tour also gives you so much insight into what life was like on the ship for crew members all of levels. You get to see the spaces where they would have slept, eaten, laundered their clothes, received a haircut, showered, and where they would have gone to purchase a treat or necessity. 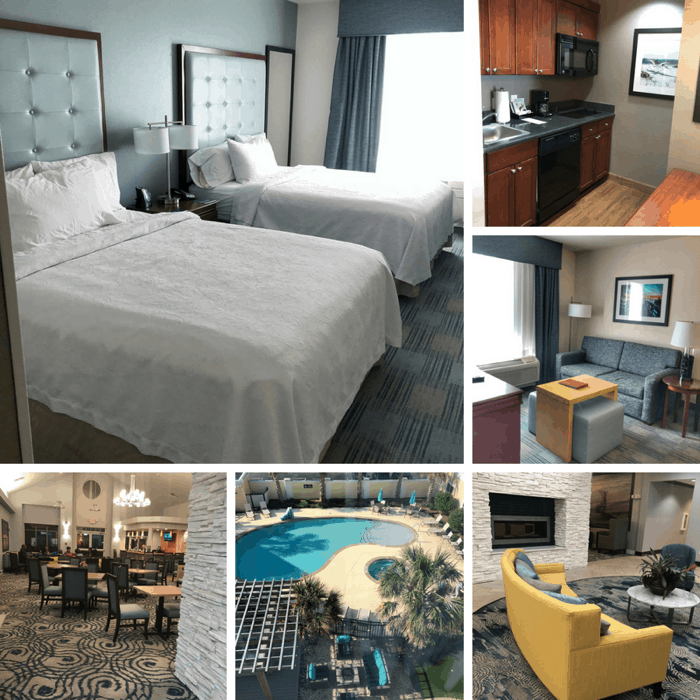 During our visit, we stayed at the Homewood Suites Wilmington – Mayfaire Town Center. 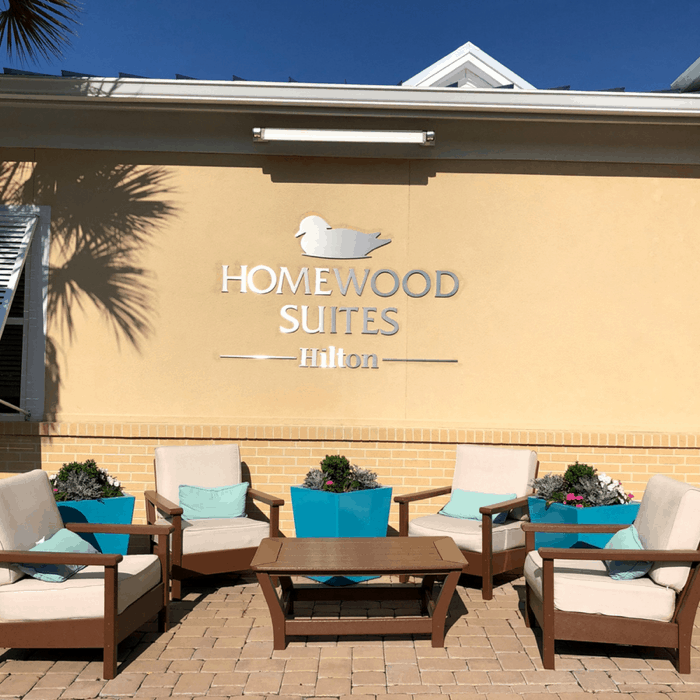 This was our first time staying at a Homewood Suites and I was really impressed! We only had a 5-minute drive to Wrightsville Beach. We also enjoyed complimentary breakfast and our suite had enough space to spread out and even cook if we wanted to….not that I wanted to….but it was nice to have a refrigerator, stovetop, and dishwasher along with all of the cookware and utensils we would need to save money on meals. 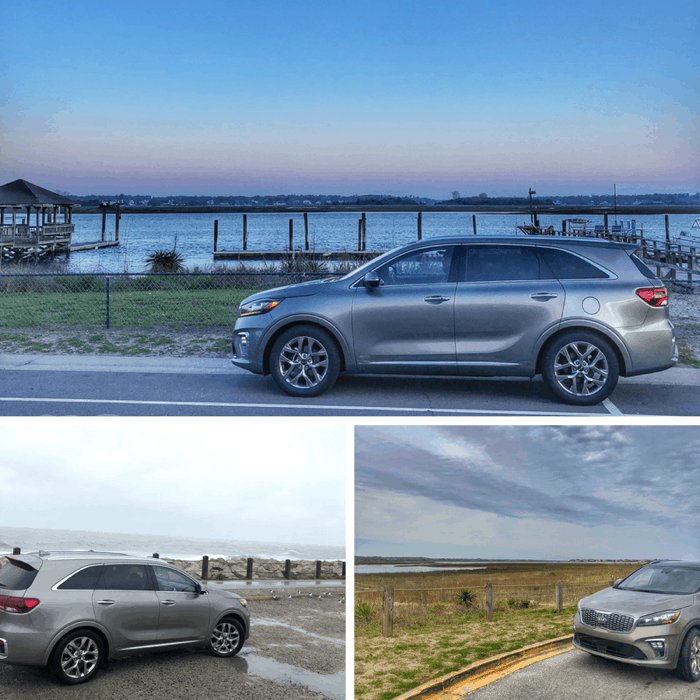 Thanks again to Kia for providing our road trip vehicle the 2019 Kia Sorento that performed great through the rain and chasing early morning sunrises and evening sunsets….with plenty of room for all of our beach gear. 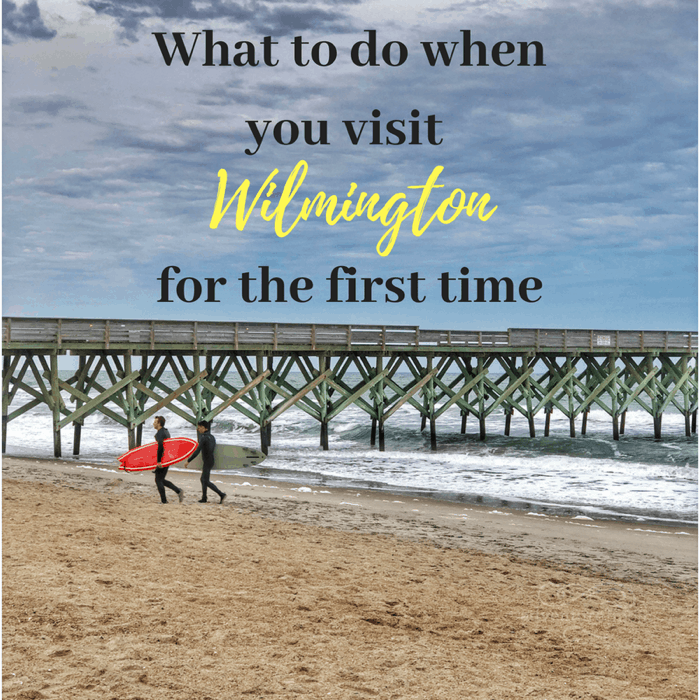 You can find more ideas for your next adventure in Wilmington from the Visit Wilmington and Beaches website. 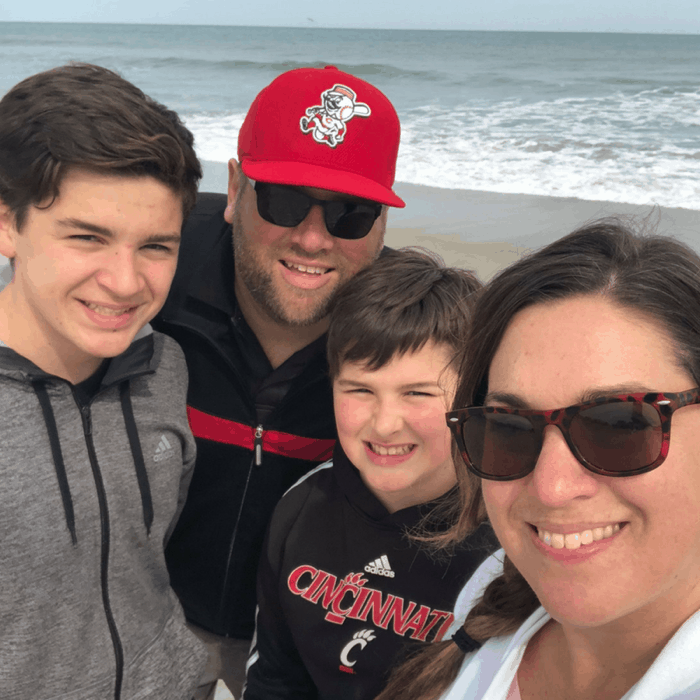 Our family had a great time in Wilmington and we can’t wait to come back! Thanks again to Wilmington and Beaches CVB for hosting our visit. All opinions are my own. I had been thinking about a road trip to Wilmington and after reading this article, I am definitely going. How could anyone read this and not want to go to Wilmington! It’s so beautiful! I recently moved here and I cannot get enough of it. I am trying to convince my sister to move here. I know she would love it too.